My mum and pop found this Airedale hanger at a little antique shop. They didn't buy it but mum snapped a photo. She calls him Dr. 'Dale even though the name on his scrubs shirt says "Dr. Appell." She said she's sure his first name is 'Dale so he's Dr. 'Dale to her. 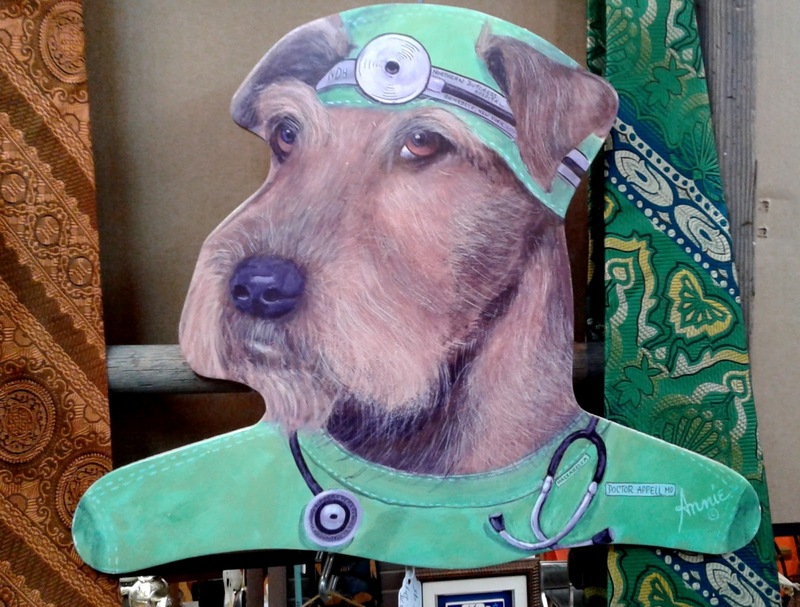 I would like an Airedale doctor but I don't think I would like Dr. 'Dale. He doesn't look very friendly or welcoming or happy to me. Too serious. 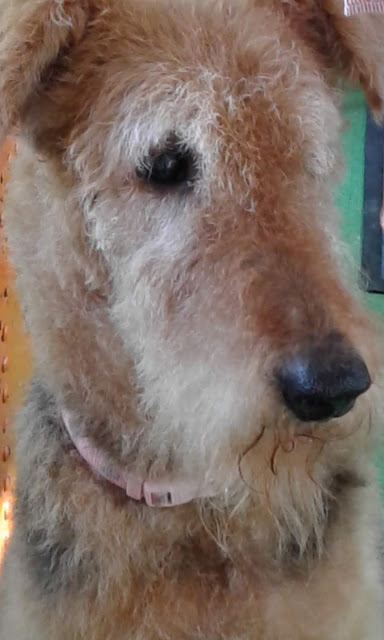 We Airedales who have health problems need doctors who are happy, friendly, enthusiastic, and also sympathetic. Maybe he would get lots of patients if he smiled a little. I hope you are healthy and don't have to visit your vet very often. Our dear and adorable Hannah turned 13 today. She's a rescue girl who's been with us for nearly 11 years. We are thrilled that she's still with us considering that in early December, when we learned her diagnosis of lymphoma, another cancer, and kidney disease, we wondered if she'd be with us in January! We count every day with Hannah as a bonus and a blessing. Happy, Happy Birthday, Sweet Hannah! How we love you! 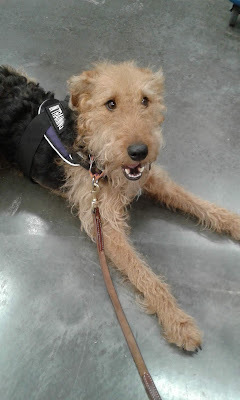 How often do you meet a live Airedale at a store? 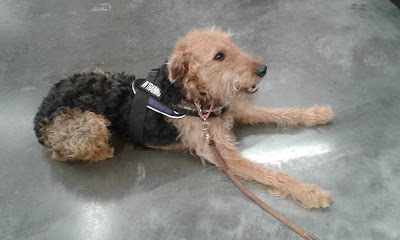 In my experience, not often, but while my daughter and I were wandering through Ikea the other day we were surprised to see a furry, black and tan Airedale. She was wearing a halter with "In Training" on the side so, before petting her, I asked if we could greet her. Her owners hesitated just a second then said yes. I told them that we had an Airedale, Hannah, at home. I asked if I could take some photos and they said sure, but when I pulled out the camera, I realized that Willow and Hannah have in common a dislike of being photographed. Willow turned her head for most every photo. We learned that her name is Willow and that she was a breeder rescue when she was about 8 weeks old. The breeder found that Willow's mother, one of his dogs, had been bred and was tied outside along with four puppies. Willow's owner said the breeder took the dogs back and found homes for them. Willow and Hannah sounded so much alike when they first arrived at home: fearful of everything and lack of knowledge of so much that most puppies learn early in their lives. Willow's owners have been working with her since she came to them nearly three years ago to help her become a well-adjusted Airedale and become a Canine Good Citizen. Visiting Ikea was part of her training. She was such an obedient girl and seemed unruffled by anything. Her owner said that she'd learned how to give hugs: kneel down and pat your shoulder. How sweet to receive a hug from Willow. 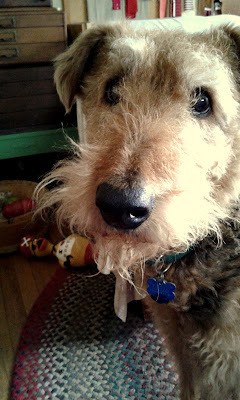 We all agreed that Airedales are the very best dogs in the world! You can still hope the vet is wrong -- at least until the results of the tests come in. And then there are just tears and sadness. Now we face the reality. In mid- December we received some of the saddest news an Airedale owner wants to hear. Nearly a week after Hannah's visit to the vet, the vet called with test results. Hannah has kidney disease, spindle cell/soft tissue sarcoma, and lymphoma/lymphosarcoma. The spindle cell cancer is slow to spread. But the lymphoma is another story. It could take Hannah's life in as little as six weeks and she could go from doing well in the morning to being on her deathbed in the evening. It's an awful prognosis. I go through my days now wondering, which will be the last carrot I peel and chop for her breakfast? Which will be the last night Hannah cuddles against me on the bed? Is this playtime the last I'll see her bounce around and toss her toy in the air? Hannah's first two years left her with a broken spirit and a fear of everything and nearly everyone. When she came to us she was underweight, knew no language--not even her name, had no idea how to go up and down stairs, and got carsick with every ride. She loved me first, maybe because I slept on the floor with her the first night, and adopted me as her mum. We were just going to foster her but I couldn't put her through one more transition. She's been with us 10 years, going on 11, and has adjusted to so many challenges. It's all just too sad to think her life will end with cancer. We love Hannah to bits and continue to enjoy our time with her, whether she's sleeping near me on the couch, watchful for food that's fallen to the floor, nudging me for an ear-rub or a treat, or just playing. 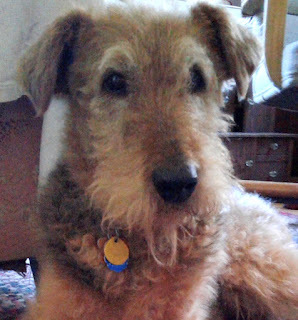 She is a dear, sweet Airedale. I wish I could turn back the clock to before the test results, when there was still hope. 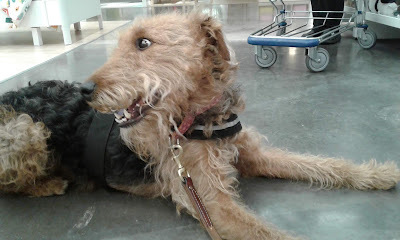 My mum and pop took me to see my vet last week. My mum usually takes me so I was surprised that my pop went along, too. I like going to see this new vet because I get big, long, thick pretzels with peanut butter or cheeze whiz on them. Oh, yum! I don't pay too much attention to what they're doing when I'm licking the good stuff off the pretzel. They didn't hurt me even though they put needles in me and took stuff out of me, in my neck and the big lump on my thigh. And then the lump started bleeding and my mum was alarmed, but the vet and the other person took care of it all. And I just kept licking the cheeze whiz off another pretzel. Mum and pop looked a little worried but I felt just fine. Then we left and came home and they gave me lots of hugs. I don't know what that was about but I sure love those pretzels with stuff on them. P.S. If you want to know, I'm not wearing a muzzle. It's a Gentle Leader collar. It's supposed to keep me from pulling but sometimes I pull when I'm wearing it. There's so much to sniff! Hannah was scheduled to have surgery last Wednesday to have her teeth cleaned and have a mass removed from her thigh. 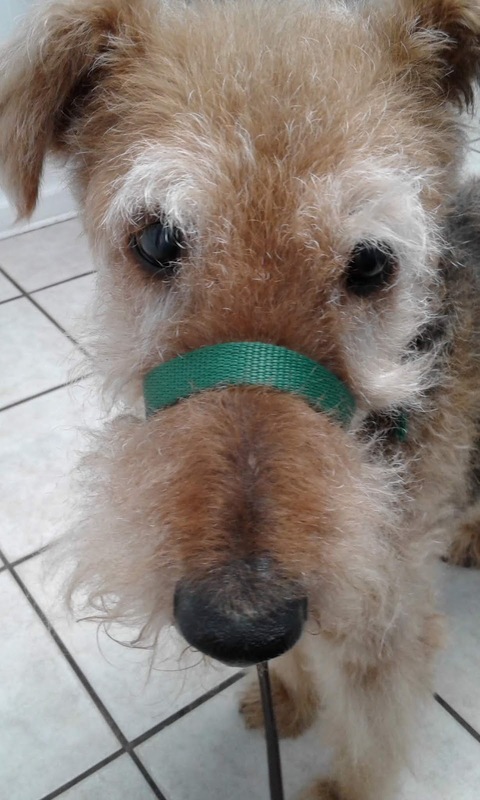 When the vets did a pre-surgery exam they decided the better course was to do blood work for her kidney values and take samples from the lump on her thigh and from her lymph nodes to send for testing. They -- and we -- have health concerns for Hannah. Hannah, nearly 13, has lost her hearing. Most sounds escape her attention thought she will usually respond to a loud clap of the hands or the beeping of a smoke alarm. No knocks at the door, no thunder, no sirens disturb her days nor her naps. She lives in a silent world. I sometimes think she misses hearing our voices. I've always talked to Hannah to explain where we're going, what's going to happen next, who's coming over, to tell her what I'm doing, etc. In the car I let her know when a left turn or a right turn was coming so she could adjust her balance, and she always did. Some people think dogs don't understand but I'm certain Hannah understood a lot of what I said. But now that she's deaf, I realize I neglected to teach her a hand sign for Good Dog! or Good Girl! I don't know what it would have looked like but I believe she misses hearing those exuberant words. Even though she's deaf I still talk to her. "What a good girl you are, Hannah!" Or, "What a great job you just did." She gets plenty of pets to go along with the "good girl" but I sense that she misses hearing it. I wish I'd taught her a hand sign so she could know when we say it. Even more I wish Hannah could still hear. What a great, good, dear girl Hannah is! 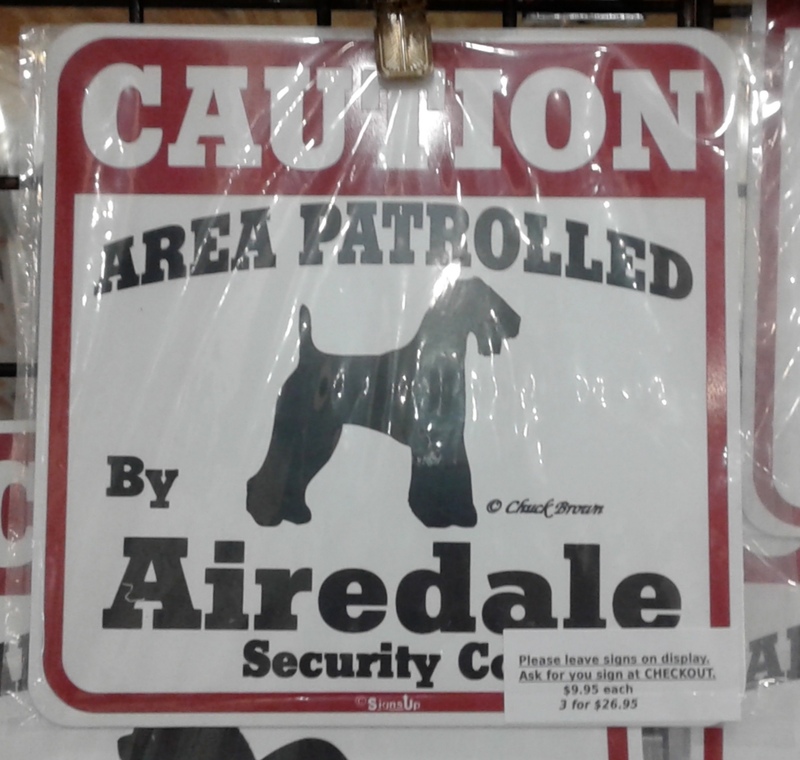 My mum is always on the look-out for Airedales everywhere she goes. 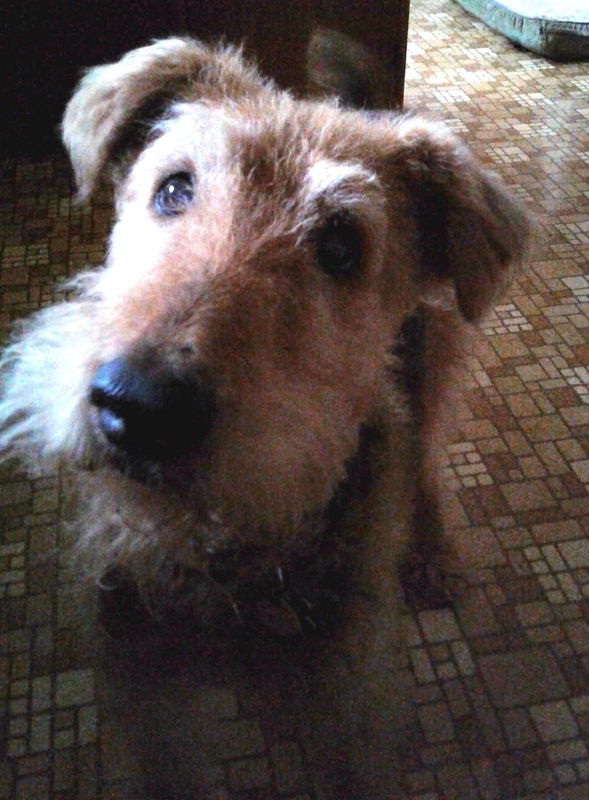 She found this cute Airedale . . .
on the tag of this pooper scooper. 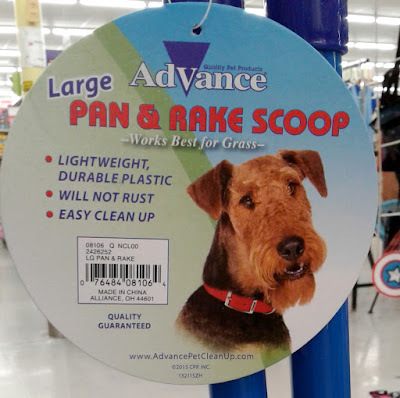 one of us on a tag for a pooper scooper? By the way, Mum didn't buy one. One day a while ago my mum quit talking to me. She doesn't say a word these days. I see her mouth moving but there's no sound. Did she lose her voice? It makes me very sad because I love my mum best in the world and I loved to hear her voice, especially her laugh and all the silly noises she made when we were having fun together. We still have fun together but it's not as much fun as when she talked to me and made sounds. I don't know why she doesn't talk to me. She used to tell me what a good girl I was and now I think maybe she thinks I'm not a good girl. But I still am! It all makes me so sad. It's like I'm in the world alone except I can see everyone and I can even see their mouths moving, but there just aren't any sounds. I wonder what's wrong with everyone. I hope my mum starts talking to me again. I miss her voice. Have your people ever quit talking to you? Mum was humming "Animal Fair" when she wrote this post. She only came up with words for the first two lines of the song, though. 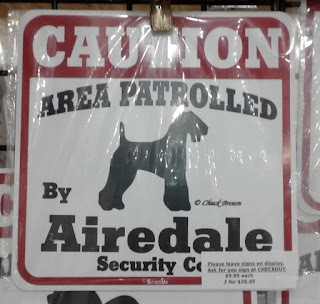 My mum sees Airedales nearly everywhere she goes but I think this is the strangest one. 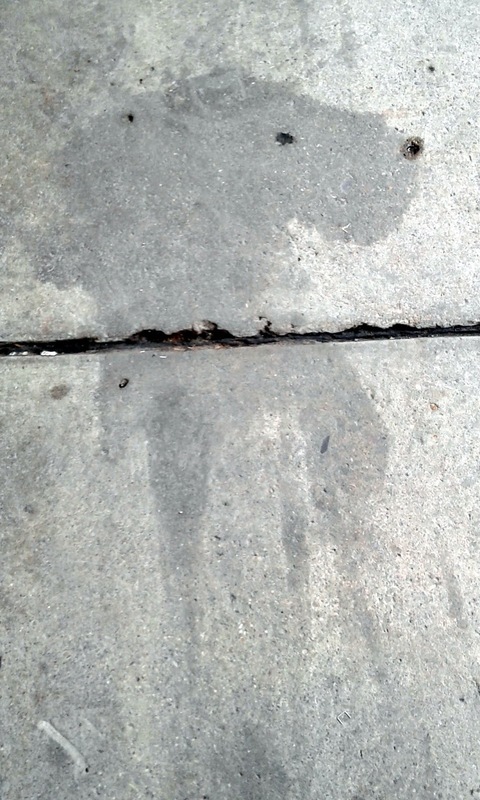 She said it was on the sidewalk. 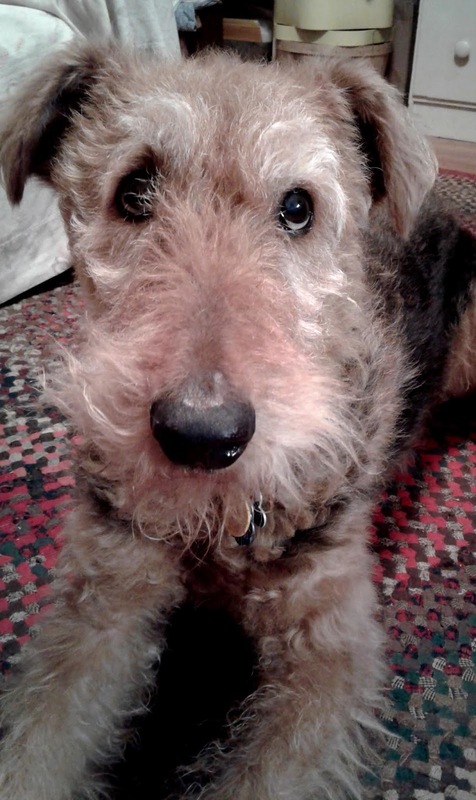 I told her it wasn't really an Airedale. And then she saw this sign. She didn't buy it. 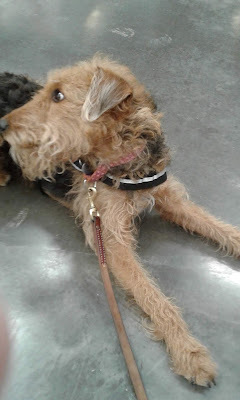 My pop saw some Airedale socks there but he didn't buy those, either. 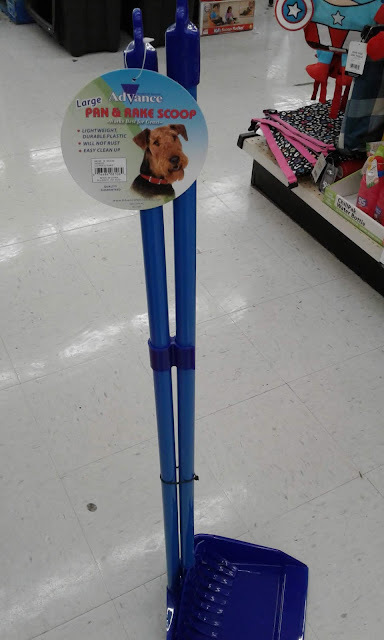 We Airedales don't need socks! Good thing he didn't buy them. Do you ever see sidewalk Airedales? This time of year -- from Memorial Day to the Fourth of July to Labor Day -- is an awful time for our Airedales. In the U.S.A. firecrackers snap, boom, and crack many summer evenings, and summer storms frequent the days and nights with thunder and lightening. So many Airedales are terrified by these unfamiliar sounds. It has been so for our rescue girl, Hannah, too. Hannah turned 12 in March. Her eyebrows have grown blonde and her gait has slowed. She needs a boost to get into bed and help to get off the bed. I noticed a week or two ago that Hannah doesn't respond when called or given a command. At first I thought she was ignoring me but as I've watched her these past weeks I've realized that she has lost most (and maybe all) of her hearing. My dear Hannah is deaf! 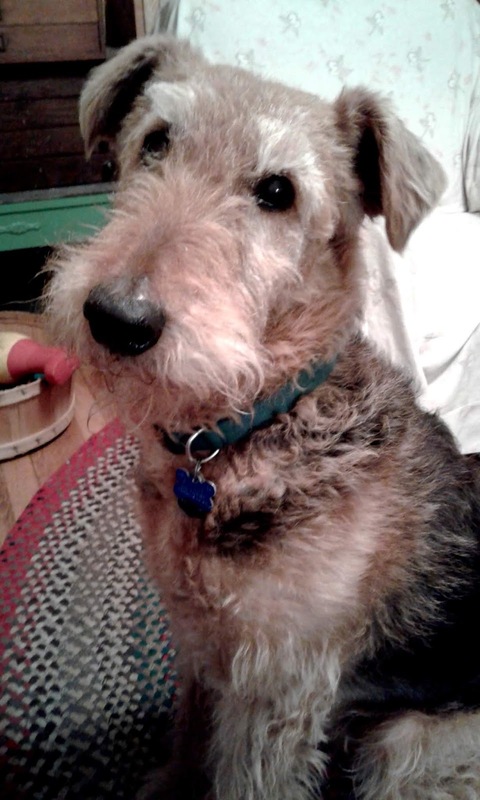 (I now live with a nearly deaf husband and a deaf Airedale!) I'm grateful that I taught hand commands along with voice commands because, it seems, that's the only way to communicate with my deaf Airedale. There is one very small blessing to Hannah's deafness: neither fireworks nor thunder cause her the least concern. I'm grateful for this peace for her. Mum is always lookin' out for our breed. She saw this Airedale . . .
. . . on the cover of The Organic Dog Biscuit Cookbook. 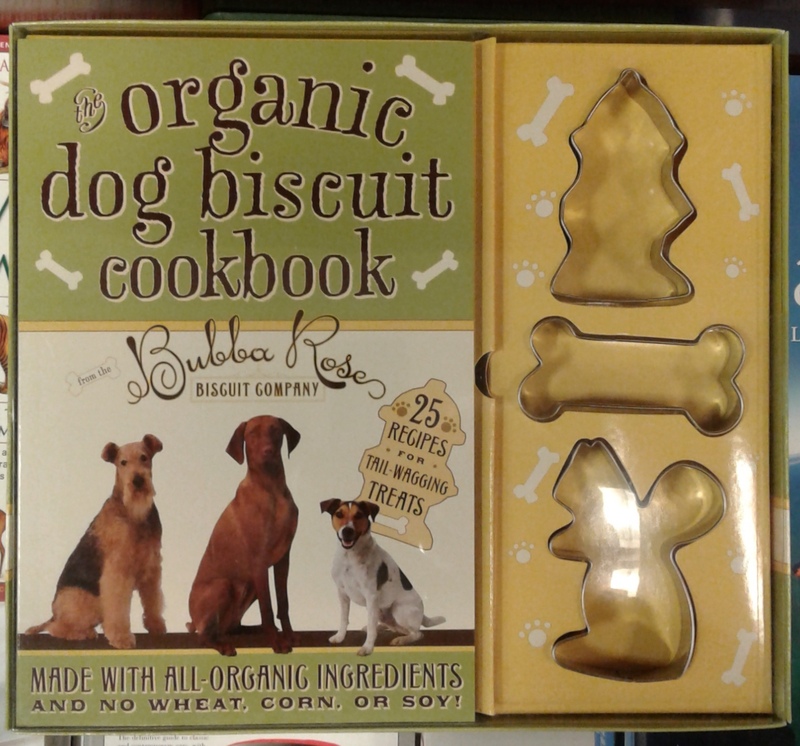 Even though the cover says it's "made with all organic ingredients" she didn't see anything in the box except the book and the cookie shapes. She didn't buy it. 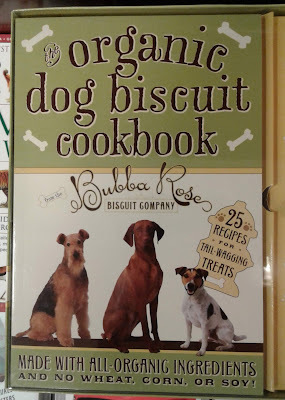 She told me we have ingredients for biscuits. 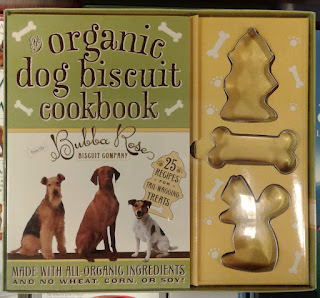 But Mum, I would like some organic dog biscuits now, please. Don't you think I look cute? Don't you think you could get busy and make them for me? I hope your mum or pop makes you biscuits when you ask! 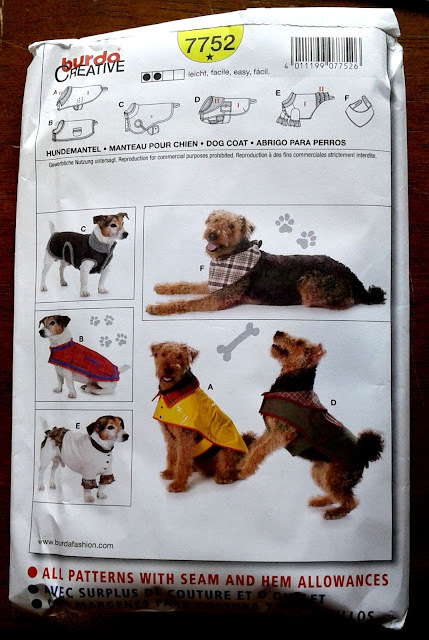 ...the Airedale is a perfect model for these patterns. 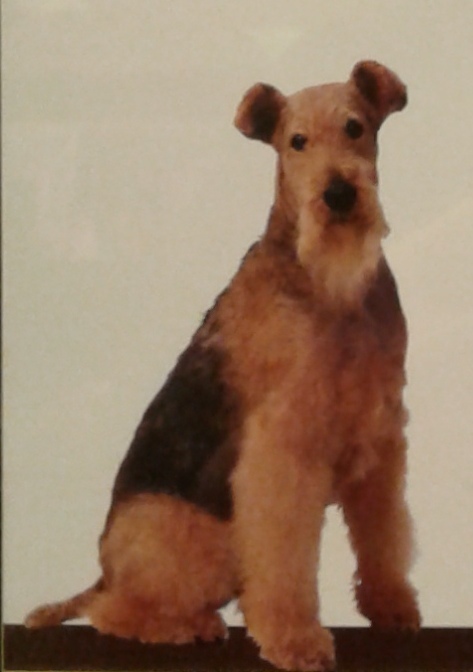 My mum loves to see Airedales as models. And she thinks we're all perfect, especially me! She has this pattern but she's never made me a coat. It's too hot for a coat now but maybe next year. I hope you're all having a great day and staying cool (unless you're south of the equator, and then I hope you're staying warm). Hooray for Hannah, Our Airegirl! Today is National Rescue Dog Day so we're celebrating Hannah today. Hannah came to us as a foster girl nearly 10 years ago. (The fostering was a fail: we adopted her instead of finding her another home.) She was 2 years and a few months old. She'd been kept outside, chained to a dog house with her brother. She was afraid of paper, the TV, the click of computer keys, doors, everything -- it all frightened her. As far as we could tell she'd never been inside a house and maybe she'd never know the attention of a human being. She wasn't house trained so I was a little uneasy about our oak floors. She chose a room off the kitchen as her safe room. I put plastic under the rug, blankets on top of the rug, brought my pillow and spent the night on the floor with her. From then on I was her best and favorite human. And it didn't take long to house train her. It's an awesome thing to adopt a rescue dog with so many problems and fears. It's equally awesome to watch her become comfortable with many of the things she feared and to see her learn and grow. We love you, Hannah, you sweet girl, and we're so glad we adopted you. Hannah says, I would like to do that kind of work but I would not like to wear that thing over my nose and mouth. It would be hard to work with that on.